50 • May 2018 • S I G N & D I G I T A L G R A P H I C S ARCHITECTURAL AND ENVIRONMENTAL S tandoff systems may, at first appear- ance, be an industry tool, but once you see one, they become ubiquitous. "When you become aware of them, you will see them everywhere," says David Pountney, marketing director of Pizazz Display Systems, a mounting hardware manufacturer in Auckland, New Zealand. "It's a richer visual expe- rience looking at those than something plain and flat against the wall. It makes displays more noticeable." 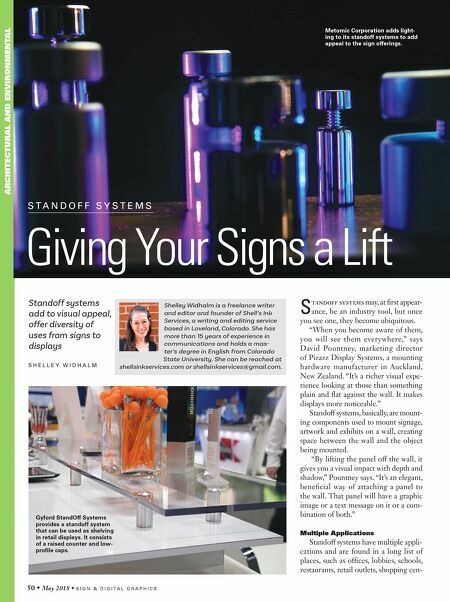 Standoff systems, basically, are mount- ing components used to mount signage, artwork and exhibits on a wall, creating space between the wall and the object being mounted. "By lifting the panel off the wall, it gives you a visual impact with depth and shadow," Pountney says. "It's an elegant, beneficial way of attaching a panel to the wall. That panel will have a graphic image or a text message on it or a com- bination of both." Multiple Applications Standoff systems have multiple appli- cations and are found in a long list of places, such as offices, lobbies, schools, restaurants, retail outlets, shopping cen- S T A N D O F F S Y S T E M S Giving Your Signs a Lift Standoff systems add to visual appeal, offer diversity of uses from signs to displays S H E L L E Y W I D H A L M Shelley Widhalm is a freelance writer and editor and founder of Shell's Ink Services, a writing and editing service based in Loveland, Colorado. She has more than 15 years of experience in communications and holds a mas- ter's degree in English from Colorado State University. She can be reached at shellsinkservices.com or shellsinkservices@gmail.com. 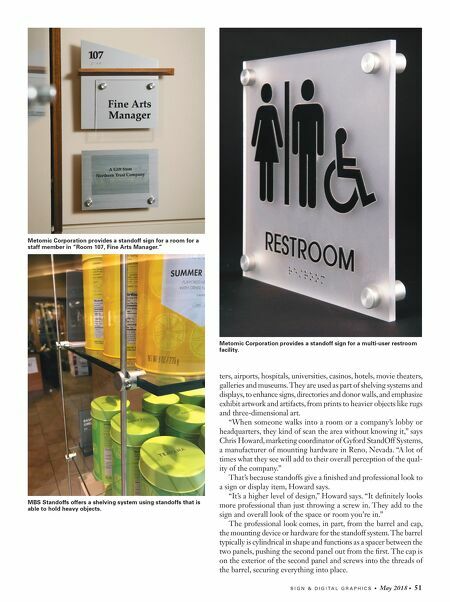 Metomic Corporation adds light- ing to its standoff systems to add appeal to the sign offerings. Gyford StandOff Systems provides a standoff system that can be used as shelving in retail displays. It consists of a raised counter and low- profile caps.